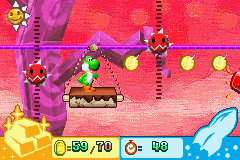 Screenshot of Yoshi with two Igashira-kuns. 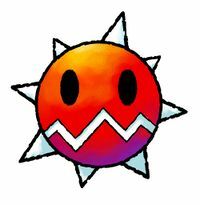 Igashira-kun are round, spike-covered enemies that appear in Yoshi Topsy-Turvy. If the Game Boy Advance is tilted left or right, they will awaken and roll to the according direction, and if the Game Boy Advance isn't tilted, they won't roll and will fall asleep. They deal three points of damage when Yoshi touches one. Igashira-kuns can also defeat other enemies, like Shy Guys and some that Yoshi can't by himself, like Tap-Taps. Igashira-kuns can also be found in wire-like constructs floating in mid-air, where they regularly move across. This page was last edited on August 5, 2018, at 15:35.